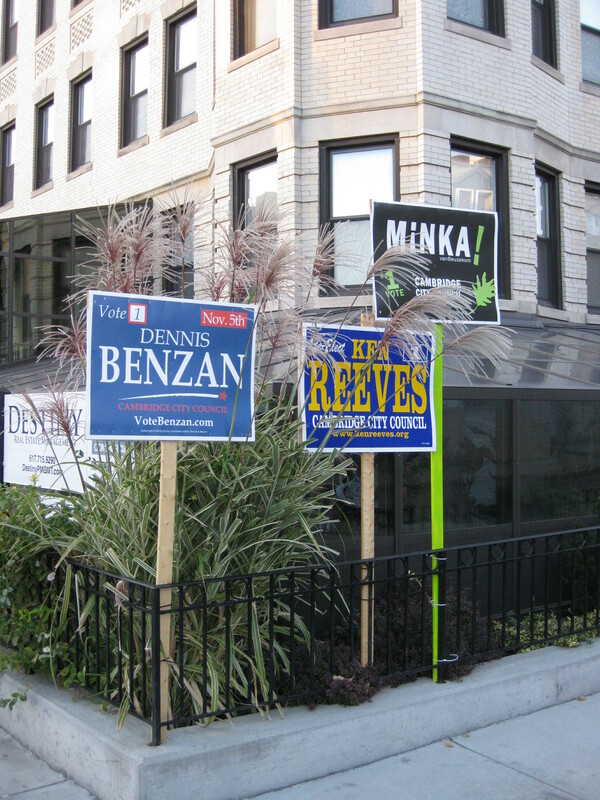 The other night the long line of sign waving supporters for Cambridge City Council candidates on Mass Ave gave me pause. Was it Election Day? I was sure it wasn’t but it *was* Tuesday after all. With so many days to vote this fall – the Boston mayoral primary, the special election to fill Markey’s seat, even the election that Corey Booker won in NJ – it’s been difficult to figure out when the Cambridge election day is. If you’re still wondering it’s next Tuesday, November 5th. Turns out the crowd of campaigners on Tuesday had gathered outside the candidates forum at the Senior Center. Next Tuesday, November 5, 2013, Cambridge residents will vote to elect City Council and School Committee members. Twenty-five(!) people are running for nine seats on the City Council and there are nine candidates for the six seats on Cambridge School Committee. 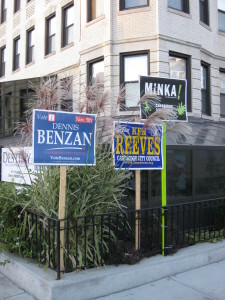 No wonder there are so many election signs around town. My intention was to link to all the candidates’ websites but instead I found an excellent page with a list of candidates that links to their interviews, statements, websites, etc. It’s well worth checking out before Election Day. It’s too easy to walk into the voting booth knowing little about many of the candidates. Since Cambridge residents can vote for more than one candidate, we’ve got more homework to do than many voters. Cambridge uses a system of proportional representation for both the City Council and the School Committee voting. You rank your choices with your vote for your number one candidate your most valuable choice. Even your number two choice matters. You have to wonder, with this many candidates, if your third or fourth place vote might matter more this year. And last, in case you missed it, here’s a link to the Boston Globe article about the 11-year-old campaign manager for one of the Cambridge School Committee candidates. Love this! This entry was posted on Friday, October 25th, 2013 at 10:36 pm	and is filed under Living Here. You can follow any responses to this entry through the RSS 2.0 feed. You can leave a response, or trackback from your own site.